I don't have a ton to say about this 2012 hardcover from Alan Martin and Mick McMahon featuring Tank Girl and her friends. I have never been a fan of that character or those comics. Forced, cool-kid whimsy was never my cup of tea, and the targets selected always seemed so obvious and bordering on the self-congratulatory. There was never a time when a target was selected for evisceration where I could sense even a chance that anyone reading would be made the slightest bit uncomfortable. I always liked the energy of the comics and the designs were always solid, but the Tank Girl material in general always seemed a little pre-packaged to me, a little ready-made. I saw the movie, but have no memory of it; it came on cable the other day and I searched the screen for a flicker of recognition only to come away empty. I've become old, and Lori Petty has, onscreen at least, stayed the same age. I'm happy for the success the creators enjoyed and the pleasure that people derive from the characters, but it's impossible to make a comic that's less for me than that one. This, however, was probably the most enjoyable Tank Girl comic I've ever read, by a significant margin. My hunch is that I enjoyed it mostly for its Whatever Happened To Baby Jane? qualities: Tank Girl: Carioca seems so far removed from any element of immediacy or direct, current relevancy for, well, anything going on here, that it ends up being kind of charming and delightful for its painted face and knee socks. This is a game, hard-working book. When you're piecing together a plot based on murdering game show hosts (zzzz) and using a kung fu named after a long-closed nightclub (better), and a plot point hinges on a character suddenly forgetting how to pilot a jet (better yet), you're basically using the storytelling tools available to someone doing this kind of comic book in a highly personal way that makes the resulting story enjoyable to the rest of us for its intermittent inscrutability and misfired connections. The entire enterprise gets an immense boost from Mick McMahon's art, which looks like it was cut out of vinyl, glued to a board, colored with crayons and buffed with a rag. 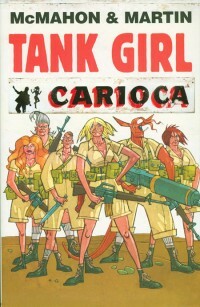 I genuinely enjoyed looking at Tank Girl: Carioca. I have no idea who is going to be buying this material in hardcover, but I guess that's sort of the charm, too.